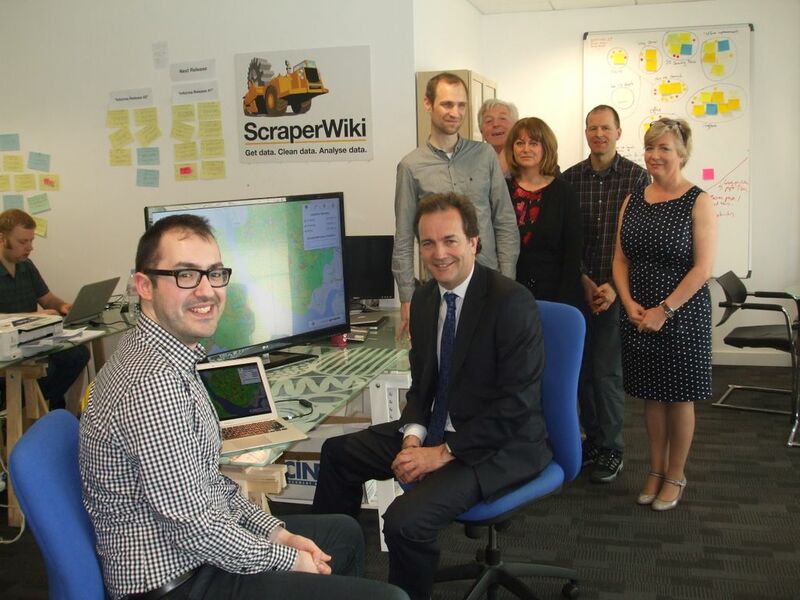 You may have heard from twitter that last Wednesday, Nick Hurd, the Cabinet Minister for Civil Society, paid a visit to ScraperWiki HQ. Nick has been looking into government data and transparency as part of his remit, and asked if he could come and have a chat with us in Liverpool. Joined by Sophie and Laura from the Cabinet Office, the minister spoke with the team about government transparency, and was—Francis tells me—amused to meet the makers of TheyWorkForYou! Nick asked about scraping, and about startup-life in the Northwest. He also asked how the Government is doing with open data, and our answer was basically that the very first stage of relatively easy wins is done—the hard work now is releasing tougher datasets (e.g. text of Government contracts). And about changing Civil Service culture to structure data better and publish by default. To illustrate open data in use, Zarino gave a demonstration of our project with Liverpool John Moores University scraping demographic data and using it to analyse ambulance accidents. “It was fascinating to see how the data-cleaning services of companies like ScraperWiki are supporting local and central government, business and the wider community – making government data more accessible to ordinary citizens and allowing developers and entrepreneurs to identify public service solutions and create new data-driven businesses.